Apples sit in a basket for customers at the Machias Marketplace March 3, 2016. In orchards, fields and roadsides all over Maine, you can find as many as 3,000 different kinds of apple varieties growing. If you expand your apple search to the rest of the United States, that number shoots up to nearly 20,000. So why is it that grocery stores aisles tend to offer just a handful of apple varieties for sale throughout the year, including the ubiquitous Red Delicious, Golden Delicious, Granny Smith and McIntosh varieties? The answer to that has to do with the modern consumer economy, a deadly cold snap that happened more than 80 years ago and a lucky mutation, according to Maine apple experts. They believe that the fact that the Red Delicious has just dropped from its 50-year perch as the nation’s most popular and most polarizing apple shows that changing consumer tastes are leading to a shake-up in orchards in Maine and beyond. The Gala apple is now officially the country’s top apple. More than 52 million boxes of the juicy, sweet eating apple are slated to be produced this year by American growers, a 5.8 percent increase over last year, the U.S. Apple Association said in a statement released Thursday. Meanwhile, the Red Delicious — an apple some dissatisfied eaters describe as mealy or akin to cardboard — has declined 11 percent from last year, with 51.7 million boxes to be produced this fall. A box weighs 42 pounds. Now the second most popular apple, the beleaguered Red Delicious resides just ahead of the Granny Smith and Fuji varieties, which are in third and fourth places, respectively. In Maine and New England, though, the Red Delicious was never the most popular apple, Moran said. That honor went to the McIntosh, or “Mac,” which shot to regional prominence after it survived the winter of 1934-1935 when many other apples did not. Even today, Mac is still the most popular apple in Maine, but she expects that within the next 10 or 20 years, it will be overtaken by the Honeycrisp and other varieties. Maine growers have been planting a lot of Honeycrisp trees, which grow better in New England than they do in some other regions and which consumers love. Change can be hard, but in this case it’s a clear improvement on the apple scene she recalls from her childhood. Maine apple historian and expert John Bunker of Super Chilly Farm in Palermo said the shake-up at the top of the American apple cart is good news for consumers. The apple cultivars that have made it to national prominence have done so for reasons that don’t necessarily have to do with their taste, according to Bunker. Chief among those qualities is whether the apple trees will bear prolifically every year. The vast majority of apple trees do not, he said, which means that 99.9 percent of apples out there have been eliminated from the marketplace for that reason alone. Another important quality to American shoppers is how the apples look, which is one reason why the Red Delicious has been the most popular apple for so many years. 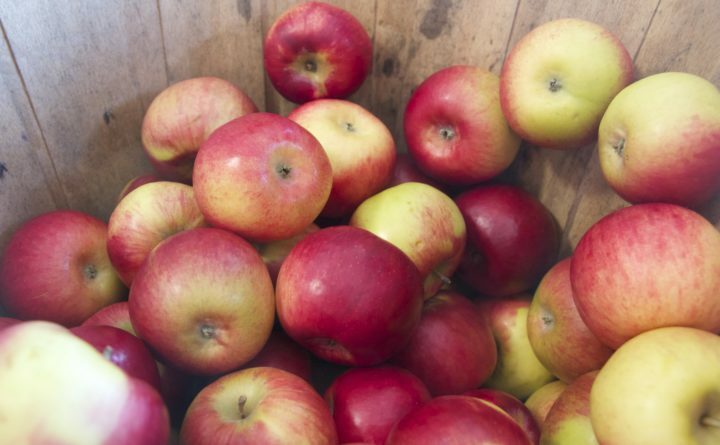 That variety started nearly 100 years ago as a wild seedling that came up in a field in Iowa that bore striped, toothsome apples, and was initially dubbed the Hawkeye, Bunker said. After a few years, it was bought and popularized by a nursery in Missouri, which changed its name to Delicious. Grower Bob Sewall of Sewall Organic Orchard in Lincolnville planted some Red Delicious trees when he first started his orchard nearly 40 years ago. Sewall, who makes sought-after apple cider vinegar from the apples he grows on his property, knows his apples. One of the problems with commercially sold Red Delicious might be the way they are stored, he said, with a refrigeration process that makes them mealy. Something did happen to the Delicious that ultimately rendered it much less so. Because apples are shipped to markets that are far from the orchards, growers have to pick fruit before it’s ripe, so it doesn’t start to rot too soon. Somewhere along the way, somebody discovered a new mutation, or sport, in the Delicious orchards: an apple that was solid red before it was ripe. Growers changed the name to Red Delicious, and shipped it merrily to consumers all over the country. Over generations, growers kept selecting for traits that would make the apples shinier, redder and more perfect looking. But they neglected to select for taste, Bunker said. So the Gala, which many widely consider juicier and sweeter than the Red Delicious, must be a good development in the apple world, right? To Bunker, the answer is complicated. Right now, most people want their eating — or dessert — apples to be crisp and juicy, a little sweet, and a little tart. A small number of varieties do bear annually and produce this kind of apple, he said, explaining that growers have used those as a starting point. Still, what he believes is the best thing to come out of shaking up the apple hierarchy is the fact that people are now demanding apples with more flavor than the Red Delicious. Almost all Maine apple growers have some varieties that many people don’t know, he said, adding that it’s a great time of year to experiment by asking for something a little odd or different. Moran said that her current favorites are the SnowSweet and the Crimson Crisp, neither of which are available in supermarket aisles, but can be found at farm stands and orchards around Maine.